Another of my all-time favorite wedding photographs, this black and white image was from Dawn and Brad's fabulous wedding at The Rose Garden in the New Orleans suburb of Elmwood, where their ceremony and reception were both held. The Elmwood area is home to several other great wedding venues in addition to the Rose Garden, such as Magnolia Plantation and The Champagne Palace. Captured during their first dance as husband and wife, the videographer's light behind them provided the brilliant backlighting effect in this photograph, but it's how they were so sweetly interacting with each other that made this shot so special. 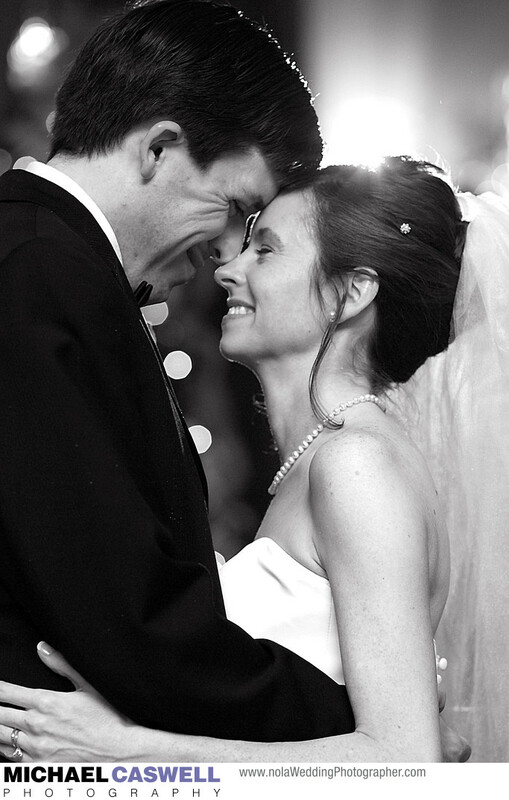 One of my favorite things about being a professional wedding photographer is that I get to document moments like this, and I love knowing that even many years later, whenever the couple pulls out this picture, it will cause them to vividly recall exactly how they felt at that particular instant. The couple was married back in 2006, and in more recent years I've also had the pleasure of taking family portraits of them with their adorable son in New Orleans City Park on a few occasions. It's always a pleasure to reconnect with past wedding clients looking to have a family portrait session! Location: 5616 Citrus Blvd, New Orleans, LA 70123.